Photo courtesy of Cedarville University. Cedarville University senior Abby Wolford (3) moves the ball down the court, Nov. 15, in a home opening win over visiting Wilberforce University. CEDARVILLE — The Cedarville University Yellow Jackets women’s basketball team needed all four quarters to put away Wilberforce, 62-52, in the home opener Nov. 15 at the Callan Athletic Center. Sophomore guard Ashlyn Huffman paced three backcourt mates in double figures by totaling 17 points, six assists, and five rebounds as Cedarville improved to 2-1. The hosts turned around a seven-point deficit midway through the second quarter into a slim 30-28 lead by halftime. Regina Hochstetler’s three-pointer broke a 33-33 deadlock at the 6:25 mark of the third frame to give the Jackets the lead for good. She finished with 13 points while Baylee Bennett chipped in 10. Wilberforce’s Mustafa Notter led the Bulldogs with a game-high 18 points and team-best seven rebounds, but was the only WU player in double-figure scoring. Angelice Kinney finished with eight points and recorded a game-high four blocked shots in the loss. The contest opened a six-game Cedarville homestand. The Jackets are wscheduled to host Ohio Christian at 5:30 p.m. Tuesday, Nov. 20 for their next home game. CU made 10-of-13 free throws in the second half and finished 16-of-21 for the game. Huffman has dished out 17 assists in her first three games. Freshman Lexi Moore came off the bench to collect four steals in 12 minutes. The Yellow Jackets have won 44-of-46 meetings all-time vs. Wilberforce. 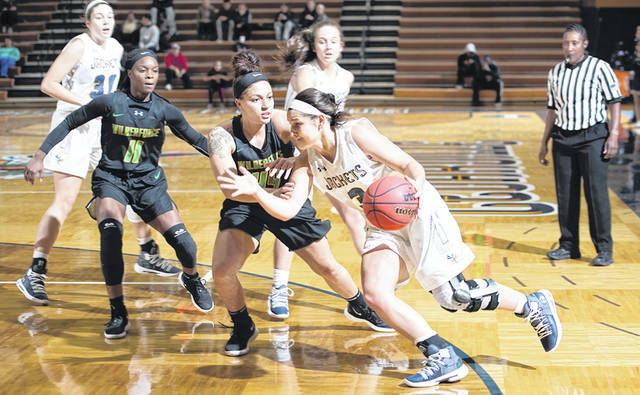 https://www.fairborndailyherald.com/wp-content/uploads/sites/50/2018/11/web1_cuwomenbb.jpgPhoto courtesy of Cedarville University. Cedarville University senior Abby Wolford (3) moves the ball down the court, Nov. 15, in a home opening win over visiting Wilberforce University.